Available with most WHITING® roll-up door models. Perfect for situations where maximum clearance within the opening is required, or with heavier door models. Double-end hinges provide additional support when your roll-up door is in the open position. When roll-up doors are open, there can be a tendency to sag. This creates a risk, particularly with heavier door models, of the door beginning to unroll and striking staff and shipments. In addition, the compartment door will not be completely open, which can cause issues when loading and unloading large or bulky items that require additional space. Adding double end hinges will add additional support to the bottom panel, reducing door sag and relieving the strain on the rollers to prevent unwanted closure. 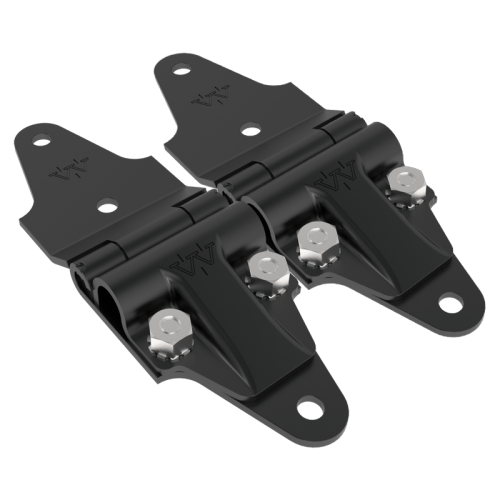 Double end hinges are used in conjunction with 5” stem rollers (available in either nylon or steel) to provide the optimum support for the door, thereby increasing staff and cargo safety and allowing the maximum clearance to be achieved within the opening for increased efficiency.